As always, there are a couple of essential factors that should guide you towards finding the best available pedal out there. CLIPLESS OR PLATFORM PEDALS: WHICH ONE IS BETTER? You don’t need to have special shoes to use them since any boots featuring a flat bottom will do the job. It’s relatively more comfortable to bail off your bike if need be. Platform pedal technology has undergone tremendous improvements in recent times, with the shape, the pins, and their overall grip becoming performance-oriented. On the other hand, clipless mountain bike pedals boast of a unique cleat that is attached to a mountain bike-specific shoe to provide the rider with an excellent connection and touch. They are efficient since the energy gets transferred to the entire pedal stroke. They are relatively smaller than their clipless counterparts, and this means they can make riding through those rocks much more comfortable. What’s more, clipless pedals will always keep your feet attached to your bike even on bumpy descents. These types of pedals guarantee the advantages of both pedal types because they offer a broad platform and an incredible clipping mechanism. They are incredibly versatile and ideal for all kinds of terrains. This implies that they are an excellent choice for individuals who intend to use their mountain bike for a wide variety of applications. Durability: You’ll always want to invest in a device that can serve you for an extended period. A great mountain bike should withstand the abuse of multiple scratches and rock bumps along the road. Weight: Of course, lighter is usually better. However, lighter pedals are known to break after a relatively shorter span. Adjustability: This mostly applies to clipless pedals where you may want to customize specific settings such as tension and float settings. 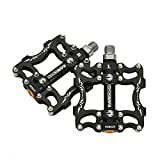 These mountain pedals are arguably the most popular at the moment, thanks to their reliability, straightforward adjustability, and simplicity. They are highly durable and feature an aluminium body construction that is equally lightweight. CNC machined 6061 aluminium body for a lightweight, durable construction. 110 X 108mm platform with 10 replaceable steel traction pins per side bite in and stick your shoes to the pedal. Here another fantastic mountain pedal that is not only ultra-thin in size but equally light in weight. It has four sealed bearings, which together with an enclosed design, prevent dust, water, and other debris from entering its rotating shaft thus increasing its service life. Its sixteen replicable skid-proof pins provide sufficient grip to prevent skidding while improving the non-slip effect, a factor that makes you adapt to the wild bike ridings. Its unique triangular structural construction, as well as the CNC integration, strengthen its overall structure, making it suitable for mountainous roads. 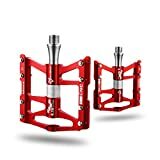 If you are a mountain biker who values serviceability, durability, and comfortability, then this particular pedal should be your ultimate choice. Simply put, it is an incredible all-round trail flat. Its massive platform provides more than enough room for even some of your bulkiest shoes. The grip is impressive too, and you’ll never lose your footing even when you will be riding on rough sections of trail. It has twelve pins on every side, which are more than sufficient to bite into any shoe and keep you grounded. What’s more, the VP is fully rebuildable, and you can achieve this through the available rebuild kit. Again, you can choose to drop off a whopping 70 grams from the set with the available Forged Titanium Axle upgrade kit. It is relatively cheaper, yet offers superb performance. Despite being reasonably light, the RockBros is exceptionally durable and also boasts of big platforms with a secure grip. Its advanced four lubricated and sealed bearings, as well as its antiskid nails design, ensures better and comfort grip. Regarding durability, the aluminum alloy material and the Cr-Mo spindle ensures that the pedal will always withstand all types of abuses along the trail. The pedals are highly versatile and are suitable for old school, folding bike, road bike, mountain bike, dirt jumper as well as BMX bike. Measuring 100mm by 115mm by 23mm, the Imrider platform provides a decent-sized surface for your feet to sit on! Its sturdy and hard spindles guarantee adequate grips to your mountain bike to help keep a sudden disconnection at bay. It features an anti-skid surface, firm grasps that prevent any skidding. It is also durability, and this is because it is made from aluminum alloy. The aluminum construction is equally lightweight, offering the much-needed comfort. Though reasonably costly, this piece of equipment is worth your money. Safe: Hard spindles produce strong grips to your bicycle to help prevent a sudden disconnection. Advantage: Antiskid nail surface, strong grasps, no longer skid. Lightweight aluminum alloys all CNC precision process, ensure the assembly precision. This is arguably the best mountain bike pedal available out there on the market, and this is because of its highly impressive features. They are not only lightweight but equally extra wide to accommodate any shoe. Again, their size will allow you to step more safely while applying much less power. The EagleRiding is also durable and features Nylon composite material that is not only waterproof but, also dustproof and anti-skidding. Its Chromoly steel axle bearing offers more stability and an extended service life.